Helinox Chair One. The name lazy boy was already taken but this chair is just as comfy. The Chair One XL is designed with a super strong pole frame, shock-cord system and packs down into an easy to carry case. 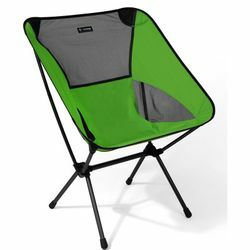 Just like the award-winning Chair One but with an accommodating seat for serious comfort, it sits higher off the ground than the other chairs in the series so tall campers can rejoice! Curl up with your s'more stick and you'll be dialed til the last log burns out. Comfort at camp just got a lot more roomy.